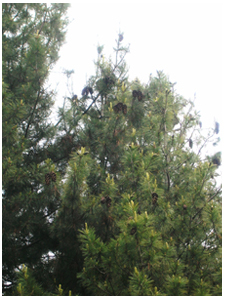 You are at:Home»Herbs»Pinus longifolia Roxb. Latin name : Pinus longifolia Roxb. Description : The oleo-raisin is used with success as an acrid, anodyne, antiinflammatory, antiseptic, aromatic, bitter, demulcent, diuretic, emmenagogue, expectorant, purgative, stimulant and stomachic. It is given in gleet, long-standing gonorrhoea and in similar affections of the genitourinary organs. The oil obtained from the chir pine is valued as a rubefacient in various rheumatic affections, lumbago, arthritis and neuralgia. The oil is also useful in treating minor aches and pains. Recommended Dosage : 2 to 4 g oleo-raisin; Oil : For external application only. Contraindication : The oleo-raisin is contraindicated in bronchial asthma and whooping cough. The oil has no known warnings or contraindications.